Here’s a good way to have Snow Camo that is effective and warm. I made my set in about 20 minutes, and the effect is great, as you can see from the pictures in this article. 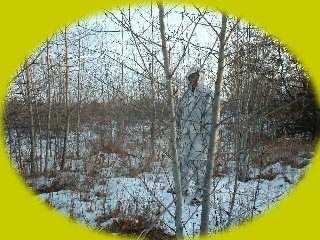 The main reason for this camo being warm is that it is made from a surplus military y white snow cover suit. The fact that is a cover suit allows you to wear whatever warm clothes you have, extra sweaters, parka etc. Being windproof it also helps keep the cold out and body heat in. The choice of the military shell was made because it was cheap,$15.00,light weight, snow won’t stick to it and melt, and it will fold up small enough to fit into a large pocket. Although it is made from nylon, the fabric weave is very small and it is not noisy as I thought in might have been at first. 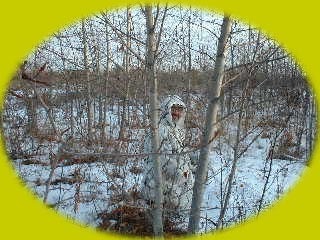 You could use the same technique to make a snow camo suit from any other white material such as coveralls. I used 2 types of paints to make my set, the first was a gray primer spray paint that is used for auto touchup, this was used to blend out the sharp outline that a black on white would produce. The second paint is called “WEBBING”. I found this in Canadian Tire stores, paint dept. 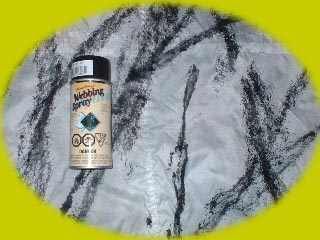 this paint is in a spray can and available in many colors, I chose black. When it is applied it takes on a very dark gray color instead of jet black. To make your camo you should think about how you want to blend into a background. 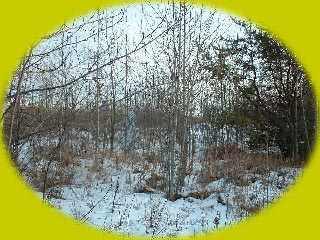 For me it was bare trees against snow. Think how the branches look, their direction. You will find that they all are going upwards at an angle and branch out from a larger branch. If your material happens to be a brilliant white I suggest that you give it a wash without detergent and toss in some soiled clothes to tone it down. Snow is not that white And isn’t shiny bright, especially under the trees. Now for the easy part, hang up your suit on a hanger and put something thru the sleeves to hold them out. Start on the back and lightly spray the gray primer in the pattern you want, starting at the bottom and working your way to the top. Remember to be sparse or you will take on the shape of a blob. Now go to the other side and sprat the base pattern on here. I do the back first so I can get a feel for it on the side that is not seen. Let the primer dry, this is a fast drying primer so it won’t take long. Now take the webbing can and holding it back about 10” start the process all over using short strokes. You can always go over a line again and make it darker or larger but ounce its on its on for good. You will find that the webbing goes on stringy and doesn’t leave a solid line; it is diffused along the edges. This is what makes this work so well. "CELSURPLUS" HAS THE WHITE OUTER SHELLS THAT I USED. CLICK HERE TO GO TO THEIR WEBSITE.